1. Digitally record and store their transactions. 3. 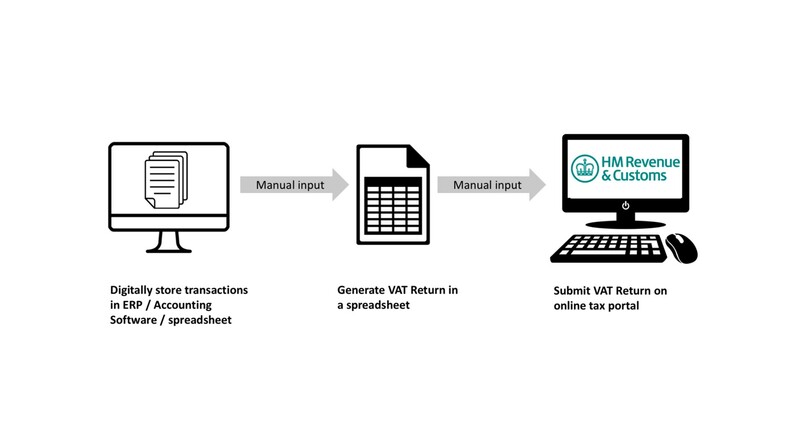 Submit the VAT Return via direct digital connection (API) from the third-party software to HMRC - every quarter. 4. Receive information from HMRC through compatible third-party software. In order to truly understand the implications of MTD and how it may affect your business, it is useful to take a look at the current processes used by business to file their VAT Returns. Generally, businesses will store their transactions digitally in their ERP / accounting software /spreadsheet. They will then manually transfer this transaction data to a new spreadsheet. This spreadsheet will contain macros (formulae) to convert the transaction data into a draft VAT Return. They will then log on the HMRC’s online tax portal and manually fill in the boxes of the VAT Return based on the output in the spreadsheet. The amount of manual input and manual transfers between systems is inefficient and can lead to significant human error. What the processes will be under MTD? With MTD, HMRC is aiming to reduce the number of possible errors in VAT reporting by replacing the manual links between systems with digital links. Instead of generating VAT Returns using simple spreadsheets, businesses will be required to use functional compatible third-party software, such as vfile (a powerful VAT reporting software tool that will soon support MTD). Transaction data will be digitally extracted from an ERP / accounting software / spreadsheet and imported into vfile, where it will also be digitally stored. 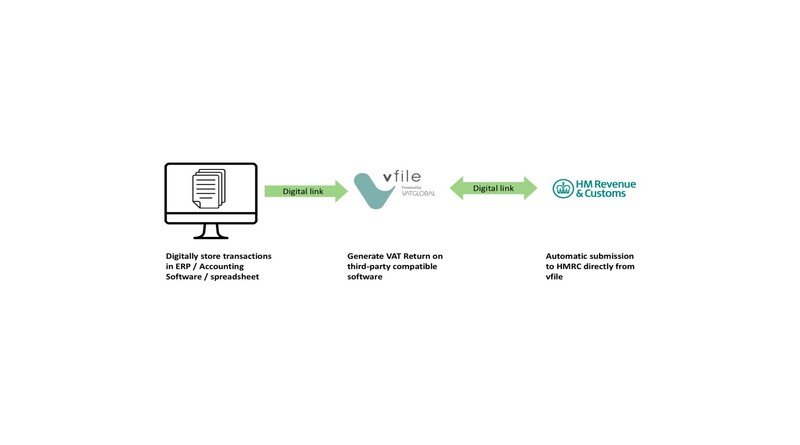 The VAT Return will then be generated in vfile and can be automatically submitted to HMRC via a direct digital connection (API). Businesses will also be able to access and receive information directly from HMRC, about their compliance record, using vfile software. There will be a soft-landing period in which transaction data can be manually transferred from an ERP / accounting software / spreadsheet to another software, such as vfile - in order to generate and submit the VAT Return. However, the long-term plan, by 31 March 2020, is to move towards a solely digital flow of transaction data at all stages of the process. MTD is nothing to be scared of. In fact, you can look at it as a positive for your business. With software like vfile, you will be removing resource-intensive and manual tasks from your VAT compliance processes. Additionally, your VAT reporting will be more secure and less error prone. This will allow you to devote more time and resources to other aspects of your business. 1. vfile is part of an integrated suite of VAT compliance products, called vsuite. With other modules that focus on workflow automation, analytics and compliance training, vsuite will drastically improve the way your business manages its VAT compliance. 2. vfile uses the highest security practices to ensure that your business’s data is extremely secure. 3. vfile was built by VAT compliance experts at VATGlobal, technologists and designers. This has truly allowed us to ensure that vfile is very intuitive. Automating complex tasks in a simple interface has been one of our main principles. 4. vfile has a dedicated team of technology and VAT compliance experts to make sure that you have all the support you need. 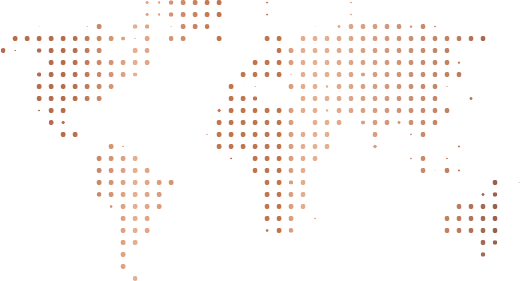 5. vfile is not only a UK-focused platform. vfile is ideal for businesses that have multiple VAT registrations in different countries. With vfile, you will be able to prepare and submit (where possible) VAT Returns in over 35 countries, with supporting documents such as ECSLs and Intrastats where necessary. vfile can either be used by in-house teams that require a software tool to assist with their VAT compliance needs; or if you would like to outsource all your VAT compliance needs to VATGlobal directly, our VAT experts use vfile internally to ensure your VAT reporting is handled accurately and efficiently.